All health sector institutions involved in disaster preparedness require training and it is the responsibility of the health ministry, as the head of the sector, to establish training policies and strategies, develop training programs and ensure that resources are available. Training curriculum can be developed jointly between the units of the ministry of health emergency and disaster management and the human resources training. Curriculum development can draw on support from specialized educational institutions. Knowledge of hazards, vulnerabilities, and risks. 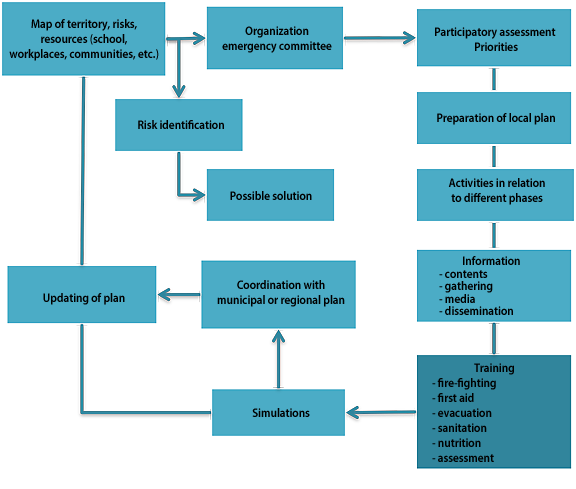 Knowledge of the dynamics of disaster management, from preparedness, prevention and mitigation through the emergency, response, rehabilitation, and reconstruction phases. Contingency plans for risks, mitigation, and response. Participatory methodologies and guidelines designed according to the required level of response. Intrasectoral and intersectoral coordination exercises. For training in response planning, for example, PAHO encourages ‘learning by practice,’ linking the training to the real-time participation on the ground, allowing participants to take into account environmental and social conditions and local sociocultural patterns. Training should involve different sectors that have a role in emergency management (decision-makers, planners, technical personnel, key levels of the public administration system, local operational entities, and community). 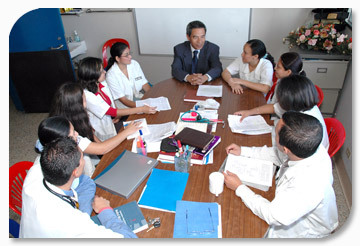 It is recommended that institutions that train health professionals (schools of medicine, public health, nursing, etc.) incorporate material on emergency and disaster preparedness and response in the curricula of their routine programs or in their continuing education programs. The health sector is also encouraged to develop protocols for research on the emergency phase to help identify factors that may impact the population’s health, and/or improve response mechanisms. Strictly speaking, all health personnel should receive in-service training. It is recommended that health workers receive specific courses on first aid, search and rescue techniques, and disaster management related to staff particular areas of responsibility. Regular simulation exercises (tabletop exercises or field exercises) are advisable to encourage broad-based participation by personnel from the management level as well as the operating level, so that they will be continually up-to-date regarding their specific functions, and will be ready to act when they are needed. These exercises are also useful for updating and improving preparedness and response plans. The health sector’s institutions should have financial resources earmarked for training activities. Such resources can be part of emergency funds, or specific mechanisms can be created to facilitate the resources’ availability and mobilization, thus sidestepping or simplifying the normally very complicated administrative procedures. In the last 20 years, various Latin American universities have created training programs at the undergraduate and graduate levels on disaster preparedness and risk management in a range of, primarily in areas of engineering and health. These include Bolivar State University in Ecuador, the University of Costa Rica, the University of Antioquia in Medellín, Colombia, and San Marcos University in Lima, Peru, all of which have masters level programs in risk management. The Andean Observatory on University Disaster Education provides an inventory of the universities in the Andean nations that have programs on disasters, as well as a list of academic offerings in other countries of the Americas and the Caribbean (this information is in Spanish). Nearly all the national civil defense institutions in the Americas have training programs, many of them in association with universities. For example, the initiative of the National Autonomous University of Mexico (UNAM) to form a National School of Civil Defense as a joint effort with the universities of each of Mexico’s states is a stimulating development. In the Region of the Americas, the Regional Disaster Information Center (CRID) has a great deal of documentation on disasters. Also, the important scientific and technical information on emergencies and disasters that PAHO/WHO has accumulated is available free of charge. You can consult these and other sources of information through this website’s homepage.